This eight-minute video by Cut Media team named The Ridge has been an internet sensation right from the moment it was published on 2nd October, 2014. 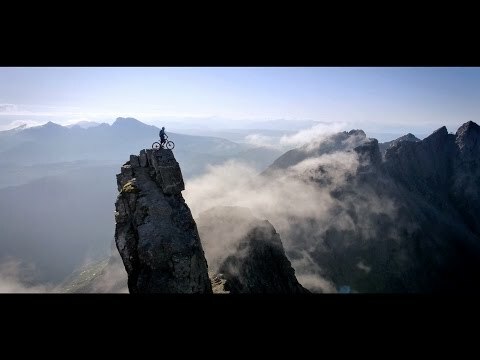 The video shows professional street trials rider Danny MacAskill climbing a mountain bike and riding down along the notorious range of rocky mountains of Cuillin Ridgeline and returning back to his native home of the Isle of Skye. Danny MacAskill is a Scottish trials cyclist, from Dunvegan on the Isle of Skye. He works as a pro rider for Inspired Bicycles Ltd. Danny got widespread media attention in 2009, when his flatmate Dave Sowerby filmed a street trials video and published on YouTube. Since then, Danny MacAskill has released multiple videos which have been extremely popular over the Internet. The Cuillin is a range of rocky mountains located on the Isle of Skye in Scotland. The highest point of the Cuillin, and of the Isle of Skye, is Sgùrr Alasdair at 992 m (3,255 ft). The Cuillin is one of 40 national scenic areas in Scotland. The background music of this beautiful video is known as Blackbird, by Martyn Bennett. In the first 5 days, The Ridge has accumulated over 10 million views on Youtube.